An enthralling instalment in the doyenne of Tartan Noir's popular Tony Hill and Carol Jordan series sees a malevolent old foe creating havoc for the fragile harmony between our heroes. Val McDermid writes some outstanding standalone thrillers, but for many fans it is her series starring dysfunctional criminal psychologist Dr Tony Hill and ambitious and gutsy DCI Carol Jordan that is most eagerly anticipated. 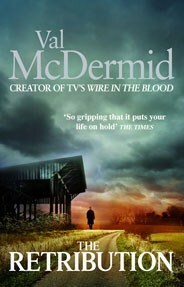 The pairing, further popularised by the Wire in the Blood television series adapted from McDermid's books (which starred Robson Green as Hill), have a pretty unique and unusual relationship in terms of crime fiction duos. Dr Hill is a socially awkward man carrying the scars of emotional abuse received as a child, but he has a brilliant mind and keen insight into the darkness in serial killers' souls. His ability to understand the worst of the worst enables him to hunt them down. Although there is a professional and personal connection between himself and Jordan, he's long resisted any romantic entanglement. They've lived in the same house, but aren't partners. They're closer than friends, without crossing a physical line. While RETRIBUTION is McDermid's 25th crime novel, it is only the seventh in her popular Hill and Jordan series, and it contains plenty of fodder to stir the passions of long-time fans, for good or bad. For not only do Hill and Jordan return, but so does notorious celebrity TV host turned serial killer Jacko Vance. Vance was the arch-nemesis from WIRE IN THE BLOOD, the second book in the series. And now, just as Hill and Jordan have found some measure of harmony in their relationship and thoughts of taking themselves to another place, professionally and perhaps even personally, Vance escapes from prison. After years behind bars he's out for vengeance, and throws their lives, and those of their colleagues, into disarray. Vance matches Hill in cleverness and wits, and has a charm that the profiler could never attain. Convicted of the murder of one teenage girl, Hill and Jordan know in their bones Vance has many more bodies on his resume, including a colleague, and that he'll stop at nothing to get whatever it is he wants. He simply doesn't see anything wrong in what he does. Given Hill and Jordan played a big part in putting him behind bars more than a decade ago, his escape casts a long and sinister shadow over their lives. Meanwhile, Jordan's team is investigating another serial killer who is on the loose in Bradfield, killing prostitutes. The twin investigations in THE RETRIBUTION make for an intriguing read. Vance is such a fascinating antagonist that we can be left wanting more of his scenes, but at the same time by drip-feeding them to us while Jordan's team is allowed to shine chasing another killer, McDermid creates an interesting tension. I found the book quite propulsive overall, and McDermid has crafted another pulse-pounding storyline that generates a visceral not just cerebral reaction, but for me her writing shines brightest in the emotional turmoil of her characters' relationships. She takes Hill and Jordan to some places that may dismay some long-time fans, who perhaps feel an ownership over their favourites (as you often see with TV viewers being upset where the writers take 'their' characters in later series), but for me things worked pretty well overall. A slick, pacy read that provides plenty of entertainment, featuring one of the better villains in British crime fiction, and leaving the future of many characters completely up in the air, professionally and personally.